Genre(s): Historical Romance, Christian Fiction. Romance, history, suspense, and mystery – what’s not to love? I’m a big fan of Elizabeth Camden’s novels, and From This Moment delivers on the features I’ve come to look for. We’ve got a strong heroine with a goal, an intriguing hero with whom to team up, and a plotline filled with suspense and danger. Oh, and romance, of course. Stella and Romulus are believably flawed characters, and clash with each other in a big way at times, which can make for some fascinating moments. They both learn some valuable lessons and change over the course of the story. Meanwhile, Clyde and Evelyn’s subplot brings a great deal of substance to the book, as they work to repair a broken relationship. And the historical context of the Boston subway’s construction makes for a vivid backdrop, with intriguing details that made me curious to learn more. And I think my favorite part of the story is how the ending plays out, but I don’t want to spoil that for you! I have mixed feelings about the audio performance for this book. I liked the characters’ voices – how they were differentiated, and how the voices fit the characters. I also appreciated the emotion portrayed in Justine Eyre’s performance, which I found to be spot on. What I found distracting, was a persistent quirk in the reading style, most noticeable in some of the narrative portions in between character dialogue. There seemed to be an extra vowel sound attached to the end of the last word of each sentence as if for added emphasis. I still enjoyed listening to the book, and while I wouldn’t go out of my way to seek out this narrator’s work, I also wouldn’t let it stop me from listening to a book I was interesting in. The book itself I highly recommend. The audiobook I recommend with the caveat that you’d do well to sample a brief passage before purchasing. Actually, I think that’s a good idea before purchasing any audiobook, as the things that bother one person may go completely unnoticed by another, and vice versa. I borrowed this audiobook from my local library via Hoopla. I was not expected to write a review, but wanted to share how much I enjoyed the story. Where you come from isn’t who you are. Ten-year-old Pearl Spence is a daydreamer, playing make-believe to escape life in Oklahoma’s Dust Bowl in 1935. The Spences have their share of misfortune, but as the sheriff’s family, they’ve got more than most in this dry, desolate place. They’re who the town turns to when there’s a crisis or a need–and during these desperate times, there are plenty of both, even if half the town stands empty as people have packed up and moved on. This tale of the dust bowl made vivid to me a place and time in history I previously knew little about. I read this one what feels like a long time ago and never got around to writing a review. But since I’ve recently been reminded just how much I enjoyed reading it, I’ve gone back over my notes and decided it’s time to share. This is a young girl’s story, told in her own uniquely quirky voice. Readers are taken on an emotional journey, in turns heartbreaking, terrifying, and humorous, by a character who is somewhat paradoxically both naïve and wise beyond her years. Pearl’s story touches on some big and discussable themes like love and sacrifice and the true meaning of family. But the aspect that stood out for me was the way the author used different characters’ competing views on the nature of God and His role in their situations. Through these different viewpoints, readers are challenged to consider what we believe and why. This is a story that could foster some great discussion in a book group setting. Highly recommended, particularly to readers up for a literary coming-of-age story with a touch of mystery and suspense. Thank you to the publisher for providing a complimentary copy of the book. I was not required to write a review, but I wanted to. 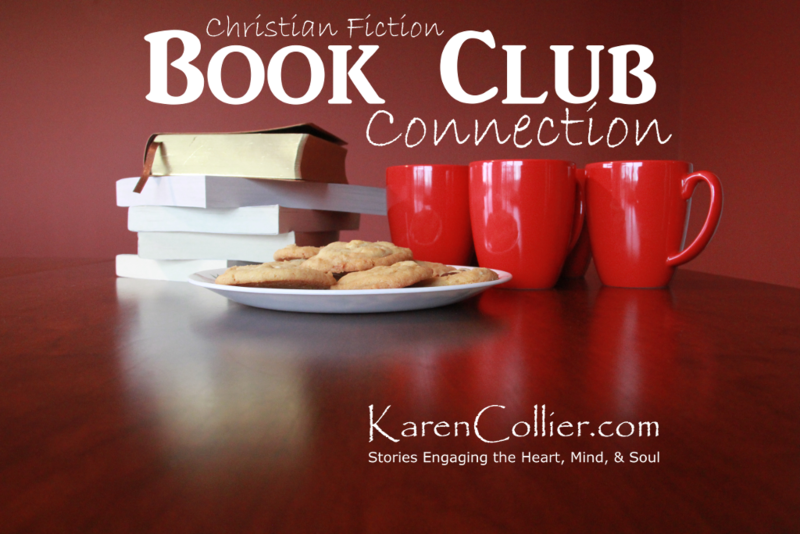 Welcome to the August 2017 edition of the Christian Fiction Book Club Connection. Thanks for stopping by! Whether you’re a pastor or ministry leader thinking of forming a book discussion group at your church, a current member of a book club, or simply a fan of Christian fiction hoping to connect with other readers, you’re in the right place. Please consider subscribing to my blog so you won’t miss future posts. The ACFW Book Club‘s August selection is Justice Delayed by Patricia Bradley. You can subscribe to the group’s e-mail list now, by following the instructions on their Web site, to be sure not to miss any announcements or discussion questions. By the Book is an in-person book discussion club that has introduced an online Facebook-based discussion option. To join in online, like the By the Book Facebook page, and be sure to check back there periodically for any discussion that may not have made it into your news feed. August’s selection is The One True Love of Alice-Ann by Eva Marie Everson. For August, the Christian Fiction Devourers group on Goodreads is discussing A Lasting Impression by Tamera Alexander AND Close to You by Kara Isaac. Grab your copies and head on over to the discussion forum to check in with others who are in the midst of reading these books. The Fans of Amish Fiction Goodreads group discusses one Amish fiction title per month. The selection for August is The Courtship Basket by Amy Clipston. To join in, visit the group’s online discussion board. Jamie of the Books and Beverages blog hosts a monthly Inklings discussion series for fans of J.R.R. Tolkien and C.S. Lewis. Sometimes fiction, sometimes non-fiction, the title for this summer is An Anthology: 365 Readings by George MacDonald. The discussion is planned for August 17, 2017.